A few days ago I was perusing my RSS feeds in Google Reader when I came across this story on Digg called Stalking 2.0: The Websites that Track Your Every Move (Voluntarily!). I knew right away this was related to Lifestreaming and by the headline I felt it was going to be a negative view so I clicked away. It was actually a link to an article on Mashable which I made my way to only after reading some of the comments on Digg first. I knew instantly that the mob on Digg had formed its opinion on the evil nature of the article so I made my way over there to see it. So, you don?t mind being followed and tracked? You don?t care if your friends can see what websites you?ve been to lately, what software you?ve been running, or even what music you?ve been listening to? Then you?ll love the web?s trend towards extreme openness: sharing everything you do on your computer. Sometimes referred to as sharing your ?attention? data, this is a growing market. Below, we round up 12 services that want to track your every move – voluntarily. Following the comment threads and trackbacks from other blogs regarding the post it Mashable has successfully created a paranoid state. Here’s a post called “Six Creepy Things I Can Learn About You“. He provides a method of finding out my favorite band, age, and my friends…oooooh….that’s so creepy! Here’s another one called “Who Needs Privacy” where he says: “It is unnerving to see so many users literally broadcasting much of their personal information to the web.” He goes on to say that he feels it will lead to identity theft…If thieves can steal our identity by knowing our age, music tastes, and friends we’re doomed. My biggest beef with users streaming their life to the web, revolves around social engineering where a person uses all of the information he can find on a particular person and uses it to his our her advantage when trying to get other personal information out of someone. Another point I tried to make was that, for as long as I have used the internet, the majority of people tried their best to remain anonymous and privacy concerns were a big issue and in some cases they still are, but users seem to be throwing all of that stuff out the window by using all of these different services that stream their life to the web. 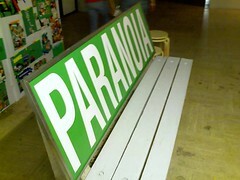 Am I really just another paranoid freak, or is there really nothing to worry about? Jeffro, as far as being paranoid or worried…I think it all depends. There is no black and white when it comes to Lifestreaming…part of it depends on the content we decide to publish and share. There are differing levels as to how much we divulge depending on those choices. Ultimately, as long as we are still in control of this I think we’re ok…the flipside to Lifestreaming is also controlling who you are on the web and employers and others use it as a tool to determine this. I think in those cases it’s good to create transparency and take ownership of who we are. I have an old friend who I connected with after years of not talking to him and he told me the story of how a jilted ex-girlfriend created an imposter page depicting him on MySpace in a very negative way. So there are times that being pro-active could be important to clear/define your name. I also remember back in the early days I had a friend that was scared to shop online fearing that someone would get his credit card number. He even went so far as to delete all his cookies after every web session and I know many more like him. The truth is/was that it’s easier and much more likely to have your credit card number stolen in the real world than the online world. I’ve shopped online for almost ten years and haven’t had a single problem, meanwhile over the same period I had 2 incidents of my card number being stolen by employees at brick and mortar stores. Also if someone really wants to stalk another person they will find a way to do it regardless of them having a Lifestream…I don’t think the stream would provide a triggered mechanism to make somebody a stalker, it would just provide an additional tool to facilitate it. Thanks for the reply. Diving into the subject a bit more, I am beginning to look at Lifestreaming in the way you describe it in your reply to my original comment. I suppose your right, if a social engineer or someone else is determined they will find a way to do just about anything to achieve a goal. I suppose streaming information such as the programs your using or the websites your clicking on across the web, really don’t pose an identity threat, but I do understand that those various streams of information help to describe who you are, at least in cyberworld. I guess Lifestreaming isn’t so bad after all. Lifestreamed users choose it ! And choosen what’s they would like to share about themselves.